Fluorescence polarization (FP) measurements are based on the assessment of the rotational motions of intrinsically or extrinsically fluorescent molecules in solution. FP is the result of the competition between the molecular motion and fluorescence lifetime of an ensemble of fluorescent or fluorescently labelled molecules in solution. It is a versatile solution-based technique that has been widely utilized to study molecular interactions, enzymatic activity, and nucleic acid hybridization. Several reporter properties such as fluorescence lifetime, linker length, hydrophobicity/hydrophilicity, quantum yield, and extinction coefficient need to be considered when developing FP assays. 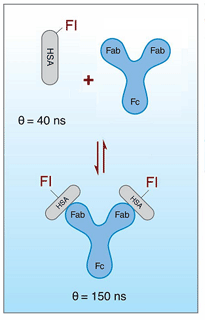 Fluorophore lifetime, antigen size and molecular weight changes upon binding determine the dynamic range of FP assays. For a general overview on FP we refer you to the following technical note (FP). Several different types of fluorescence polarization labels are available for homogeneous FP assays. SeTau FP labels exhibit lifetimes from 9 to 32 ns and are suitable for measurement of antigens with molecular weights in the range between 10 and 80 kDa. This MW-range has not been addressed with common polarization labels or metal-ligand complexes (MLCs) based on Ru, Os or Re. The superior red-excitable FP labels (e.g. SeTau-647 or Square-660) have lifetimes in the order of 3 ns and are very photostable. On one side HSA (the antigen) is labeled with SeTau-425, a long-lifetime label with a lifetime of 26 ns lifetime (left), and on the other side (right) with fluorescein, a commonly used 4 ns label. In the case of SeTau-425 the labeled HSA has still a relatively low starting polarization of 165 mP and only upon addition of the specific antibody the rotational mobility changes and as a result the polarization increases. A different behavior is seen with the fluorescein-labeled antigen (right): The labeled antigen has a polarization of 130 mP. Typically one would expect a much higher value but the lower polarization is due to the fact that several fluorescein molecules are labeled on one HSA molecule and undergo homo-FRET. Due to homo-FRET the polarization value for the conjugate decreases. Nevertheless, the important observation here is, that there is neither a polarization increase observed upon titration with the specific (red) nor non-specific (blue) antibody due to the fact that the lifetime of fluorescein (τ = 4 ns) is much shorter than the rotational correlation time (Θ = 40 ns) of the antigen. Measurement of high molecular-weight analytes (10 – 80 kDa) in a fluorescence polarization assay (FPIA). For more specific data we refer you to the specs sheets and the table below. Red excitable dyes with longer lifetimes between 1.6 - 3 ns and larger Stokes' shifts in the order of 21 - 50 nm for use as labels in FP assays are shown in the table below. These labels have unmatched sensitivity (extinction coefficients of up to 275,000 M-1.cm-1 and Q.Y.s up to 60% in aqueous solutions) including very high photostability. SeTau-647 and SeTau-670 are more sensitive labels for polarization measurements compared to Alexa 647, Alexa 660 or Cy5! SeTau-647-maleimide (K9-4148) has been successfully used in time-resolved fluorescence polarization studies of the kinetics of myosin and in fluorescence measurements of the spatial distribution of the lever arm in the left and right ventricles of human hearts . For additional data we refer you to the specs sheets in the product table below. DNA hybridization reactions can be easily monitored by means of fluorescence polarization using the newly developed fluorescence labels from SETA BioMedicals. Square-660-NHS is a fluorescent label that is easily coupled to amino-modified oligonucleotides. It is a very sensitive fluorescent polarization label with absorption and emission maxima and the NIR range. Covalent attachment to an oligonucleotide results in an about 10-fold increase of its fluorescence lifetime (lifetime for labeled oligos are in the order of 3 ns) and a low initial polarization of the labeled oligonucleotide. Interaction of the dye-labeled oligonucleotide (see below) with the complementary oligonucleotide or DNA leads to a significant change in fluorescence polarization due to the increase in mass and reduction in lifetime of Square 660 (from 3 ns to 1.8 ns) upon binding of the complementary strand or DNA, which further helps to increase the dynamic range of the assay. Based on the increased lifetimes of Square-660 in presence of oligonucleotides this dye is perfectly suited as a label for in-situ hybridization assays using fluorescence polarization as the read out parameter.